Yolande, the Huron-Wendat storyteller, wore moccasins, which made her feet seem small, and cat-eyed blue glittering glasses, which likened her eyes to the moon. In her traditional garb, she spoke from memory. Scissors for fingers, she snipped at the air. Gesturing gently above her head, her hands floated like birds on the wind of her words. Silence filled the longhouse, light danced off of furs lining bunks against the walls, and Yolande took a sip of soda, closing her dinner-plate eyes behind those jewelled lenses. I looked over at Dan, Andrew and Will, each a storyteller in their own right—words, film, photography—but I didn’t catch a single eye. Like boys at Grandma’s story hour, they sat on their log stools in silence, their cameras on their laps, the firelight flickering off their faraway faces. Yolande led us to a fire outside. We rolled dough around sticks and placed them over embers while competing over whose bannock was best, as Dan’s fell apart in the fire. We clinked our cups filled with tea and said “Salute,” while keeping our tradition of looking each other in the eye for luck. Then Yolande sang, and we kept a beat with the rattles she’d given us. Dan and Andrew competed for the loudest shake, as Will kept an actual tune. The song ended with a crescendo, a long rattle into the night. We left Yolande, the longhouse and furs behind, made our way toward the main building, with its modern lodging, crisp white sheets and fine-dining restaurant for a dinner of wild boar. The Wendake reserve is just 15 minutes outside of Quebec City. It’s a suburb but simultaneously a self-governing territory, containing a modern hotel, museum, centuries-old church and life-sized recreation of a longhouse. The juxtaposition of a long cultural history with new-age values was not lost on me—Yolande’s moccasins and sparkly glasses, the Wendat’s oral tradition explained on their Facebook page. Somehow the marriage of both made everything more beautiful because it meant this generation is fighting to keep it. You can spend melodic days here—and I highly suggest you do—hearing the stories of the Huron-Wendat people, and remembering that the history of this vast land runs longer and deeper than 150 years. The story of a place is weaved into its people—that’s what the Huron-Wendat say—and that’s exactly what I’d learned at Wendake, and exploring and cycling around lower Quebec with Team Outpost. When Dan, Andrew and I—three strangers—arrived at Will’s farm in Quebec’s Eastern Townships some ten days earlier, the sun was shining, the leaves were green and the air was warm. Summer showed no signs of slowing and fall, no signs of showing. Long fields and rolling hills, this was the Eastern Townships. Not the cobblestones of Quebec City, but country roads with few traffic lights. Not the glitter of Montreal, but farms and hay bales, evergreens and deciduous trees, McIntosh and Cortland apple fields, the occasional plantation of pears. As travellers always do upon first introduction we talked about the weather, our jobs back home, and the stops we’d make on the trip to come. Team Outpost cycling across Quebec. As a cow mooed in the distance, Dan asked if it was broken. Will shook his head, while Andrew looked questioningly at me. I shrugged my shoulders and laughed. Will led us down a hill. The grass was already wet with dew, which sneaked through my shoes, and we discussed how we’d best capture the views. The sun began setting and we scrambled to assemble our tent poles in its dissipating light. Distracted by the sky and colours that I didn’t even know existed, I was slower in my assembly than I would have liked. Before we said goodnight, we craned our necks again. Stars pixelated the sky like a mirror of the dew, and despite being in the Quebec countryside and away from the city lights that I usually tend to know, I was at peace. The crest of the hill seemed to meet the sky. As I peddalled upwards the struggle manifested in my thighs, but I knew it started in my brain. Some call it suffering. But I’d heard explorer Mike Libecki call the feeling “pre-joy”—it’s not joy yet, but it’s coming. I wondered if he was right. At the foot of the hill I felt good, energized. My legs burned in all the right places. Dan and I even tried to carry on a conversation. “Our first stop is a vineyard,” Dan heaved from somewhere behind me, as we overcame the crest of the hill. Indeed, joy was coming. (Swiftly, I hoped.) 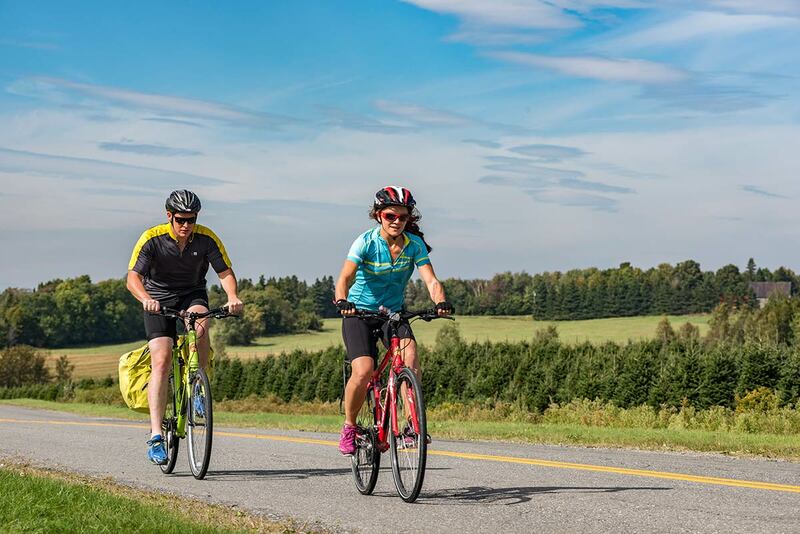 Cycling in Quebec’s Eastern Townships in summer is paradise found—but like all visions of Nirvana you must work for it. La Route des Vins is renowned for its wineries. The Townships’ La Route des Vins (the Wine Route) stretches 140 kilometres long—all of which you can bike-trip down!—and is home to more than 27 wineries. Yes—despite the cold, frosted Quebec winter, grapes do grow here! 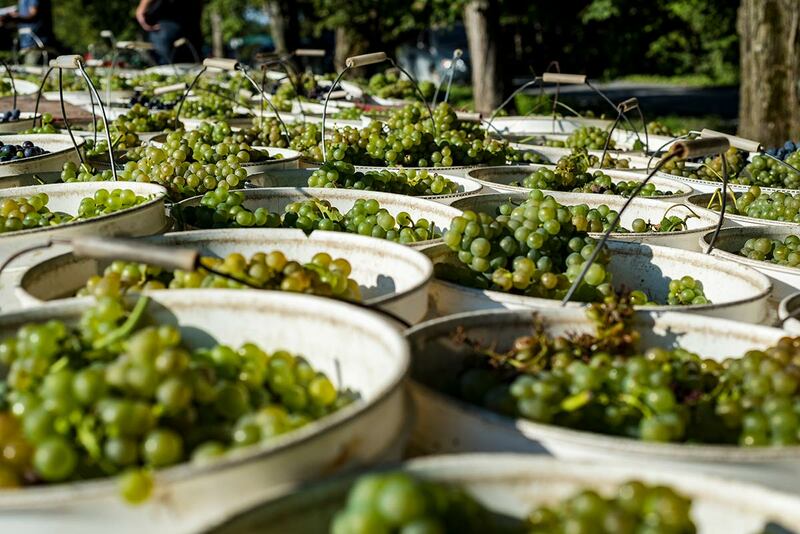 The Quebecois taste for the happy grape goes as far back as French explorer Jacques Cartier, who noticed the abundance of wild vines growing on Île d’Orléans on his first trip up the St. Lawrence. He called the grape-filled island “Ile de Bacchus” after the Roman God of agriculture, wine and winemaking. Not just any grape can grow here—and it takes a certain type of person to grow them. (Even Samuel de Champlain tried his hand and failed.) We saw the challenges firsthand—and how they’re so ingeniously solved—as we detoured through the vineyard. On our way toward l’Orpailleur Vineyard—a wine pioneer in the province—we passed six hard-muscled men who were mining a press of grapes. They were chucking full buckets into a contraption, which sifted the fruit from stem like gold from gravel. (L’Orpailleur roughly translates to “gold seeker!”) No rest for the wicked or the winemaker; we were told that just the day before more than 1,100 buckets were filled with grapes. And what we were witnessing was just the first press of the day—they would do two more before its end. Beyond them, grapevines ambled into the distance, touched ever so gently by the morning light and the shadows of the giant turbines looming over the fields. Such a stark contrast to the cold slap the grapes endure during winter, protected from the snow and buried under the dirt. While the winemakers bury the buds under the soil for protection during colder months, a late springtime frost could kill an entire year’s crop. That’s what the turbines are for: they protect the grapes. When turned on they force warm air down, increasing the temperature by about four degrees, which is just enough to change the weather and save the crop. While I could have happily stayed basking in the morning sunlight with a bottle of wine, I placed practicality before pleasure—and somehow convinced Dan to do the same!—and went back to my bike. We had hills to crush and miles to go, after all. La Route des Vins is part of and spills off the more renowned La Route Verte (the Green Route)—which is North America’s largest, most extensive and dare I say it, enjoyable cycling route. From the border of Ontario and across Quebec, it spans from the Laurentians to Montreal, the Eastern Townships to Quebec City and the Saguenay—Lac-Saint-Jean, and beyond. Vélo Québec, a not-for-profit that advocates for cycling to reduce environmental impact and increase individual well-being. Yet it didn’t really take off until after the Quebec government came on board in 1995 and now, astoundingly, it connects more than 400 municipalities within the province via 5,300 kilometres of track. 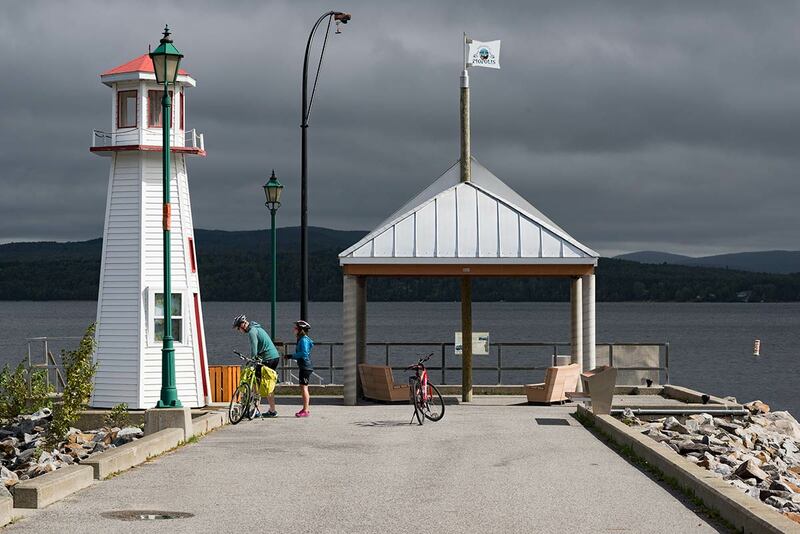 A cyclist’s dream, La Route Verte is a network of on-the-road rights-of-way, rural roads and bike paths that includes rest stops, campsites, accommodations and information centres along the way. Sure, every now and then you hit the inevitable pothole or skid through a small gravel graveyard; but for outdoor enthusiasts nothing beats the incredible views—the verdant fields!, the coastal rides!—and the access it provides. No shortage of greenery to look at. My legs already felt sturdier, and I could see that Dan, too, was catching a stride. There are so few genuine, guilt-free pleasures in life—and the down slope of a steep hill, after a cycle up, is absolutely one of them. Maple sugar pie is not. After one last refreshing downhill sweep, we arrived at Frelighsburg, a small municipality in the southern Quebec region of Brome-Missisquoi, which lies on the border with the United States and just under the shadow of Mount Pinnacle. I got off my bike and with sea legs wobbled to the de facto home of maple sugar pie—Les Sucreries l’érable—and collapsed at the picnic table where Dan, Will and Andrew were mulling over their menus. Homemade apple juice, and smoked salmon on a Montreal-style bagel with cream cheese as thick as the padding in my cycling shorts. While I’m fascinated by how group dynamics shift and stutter, ebb and flow until the formalities wash away, with this group it didn’t take long. I wish I could say I ate slowly and carefully, savouring every bite—but I think I out-ate the boys. After the maple sugar pie, we sat in a stupor. It was just noon. Back on the bikes, I felt so heavy that I actually wished for a hill to conquer just to burn it off. “We’ll meet you up ahead,” Andrew said. “See you in five kilometres,” said Will, as they piled into our support van. “Five kilometers, that’s nothing,” I said over my shoulder. “I bet we’ll beat them there,” Dan shouted back to me. They disappeared around a bend, leaving us with the grinding of our wheels on the pavement. The path was straight and narrow, until it suddenly wasn’t. We started up a hill and made it to a bend, but the hill continued. Upwards it went, and then higher it continued. “It just keeps going,” Dan said, as I wiped sweat from my brow. The light poles came and went as well as many trees, and yet after every rounded corner the hill slithered up. Legs on fire, we pushed forward until a buzzing began to ring in my ears. At first I thought it was a vulture, but then our drone came into my vision. I looked up and waved—then I saw the incredible view. Beyond the rolling hills and fields of green, the Adirondack Mountains were in full splendour, and when I looked farther I could even see Vermont. When we arrived at the Mont-Mégantic observatory our plans to see a night sky lit by only stars was stubbed out with the force of an asteroid hitting the moon. “Can we look through the telescope?” asked Will. “Can we use a tiny bit of light for our photos?” asked Andrew. “Can we…?” Dan began, but “no” came the reply, almost in reflex. There was no chance we were going to see the stars that night. And what a shame. From the Eastern Township’s Dunham through Coaticook and all the way to Mont-Mégantic National Park, we’d come to see the Dark Sky Reserve. Situated in the midst of the Appalachian Mountains, the park and the surrounding countryside, the reserve received its designation in 2007, but not for the reasons I assumed. While the area is inherently dark, the darkened sky itself is not a natural phenomenon; it took the combined efforts of an entire region to produce it. Mont-Mégantic is home to the ASTROLab, a learning centre located at the base of the mountain, devoted to making astronomy both accessible and available to everyone; where people of all ages can dip their toes into the complex mysteries of the universe and understand them simply. At the top of the mountain, there are two observatories. The first is l’Observatoire populaire, designated for school groups and visitors, which is home to a 60-centimetre telescope. The second is the scientific observatory, reserved for scientific research exclusively, and home to a telescope with a lens large enough to, oh, you know, zoom in on Andromeda! Led by the ASTROLab, the observatory and the National Park, Mont-Mégantic was officially inaugurated by the Dark Sky Association as a reserve after a hard-won victory, and by getting not just one, not even 10 but 35 communities on board to agree to reduce light pollution. Now when you walk the streets of Granit, Haut-Saint-François and Sherbrooke at night, you’ll notice the streetlights are dimmer and the dark is darker. The municipalities have mandated that outdoor lighting points downward, and only high-pressure sodium bulbs are used, which emit a less obtrusive yellow-orange glow rather than an LED’s typical harsh blue hue. More than 2,500 light fixtures were replaced and the effort has created near-perfect conditions for astronomers who wait for months for a turn to put an eye to the 1.6-metre lens telescope at the scientific observatory. It seemed we would have to wait, too. Tails between our legs, we returned to the auberge—a family-run inn—to contemplate our existence in ways more finite than imagining the length of a light year or the texture of dark matter. Over dinner, we talked hypotheticals and backup plans. I suggested we bivvy on Mont Mégantic’s neighbours, Mont Saint-Joseph or Victoria—Dan suggested we “bevvy” instead. “But the observatory under the Milky Way!” Andrew said, as the sky opened up and rain pelted the windows as if sharing in our despair. Drowning our sorrows in butter and escargot, we had just about given up when a call from Guillaume Poulin, a scientific communicator at the observatory, came through. He may as well have burst through the doors with an exo-planet balanced on his fingertip like a basketball. Not only would we get to see the stars from the top of Mont Mégantic the next night, but close up through a telescope, we’d see the Moon. We clinked glasses in a great “Salute!” to the stars that aligned for us. A reminder, that even as adults, we should wish on them more often. “Would you like to take a look?” Guillaume asked, as he cracked a bar of dark chocolate and zoomed in on the Moon. He may not have known that drones and Quebec’s microbrews were the way to the rest of the team’s heart, but he sure knew the way to mine. As promised, the night was clear and the top of the mountain was cold. Like a curious eye through the crack of a door, the telescope peeked through the roof of the l’Observatoire populaire at the sky. We lined up in a queue, much like kids on a school trip do. As Will moved up the ladder putting his eye to the telescope, Dan and Andrew started singing Ground Control to Major Tom, and one by one we looked up at the Moon. For something I see every night, I’ve never imagined it like this before. The grey, blank desert seemed not a desert at all. For a place without life, it seemed to me to be marked by it—it had texture and features; pockmarks and valleys; craters within craters; and mountain ranges as high as the Alps. The landscape wasn’t barren, but alive with a history of things colliding into it. For the next hour, Guillaume took requests playing astrological DJ, spinning the telescope like a record into place. Did you know that from 1.2 billion kilometres away Saturn looks like a Cheerio in the Milky Way? Or that a dead star looks like an eraser smudge? Or that the stars in the Hercules Globular Cluster look like a spider’s web in the rain? When we pried our eyes from the lens and walked outside into the night, I was sure the sky had fallen. A billion tiny points of light poked holes in the blackened horizon that draped all the way around us. We walked to the summit to watch the Moon set and while we pressed our eyes to our cameras capturing the night sky, within the walls of the observatory behind us astronomers were capturing the nuances of the galaxy, with eyes pressed to telescope. Will and Andrew set their cameras to time-lapse and we retired to our cabin on the mountainside. We talked late into the night, while the cameras consistently clicked, capturing the old celestial light that worked its way through dark matter, the atmosphere and the city lights, right onto our sensors. So this is what breathing should feel like. As we followed La Route Verte north from the Eastern Townships, the Saguenay came at us not only with its magnificent fjords but with a rushing gust of the smell of pine. We rolled down the hill into Sainte-Rose-du-Nord, a life-like Christmas village known as the pearl of the fjord. Down on its sleepy pier, fishermen cast lines out into chocolate water. They sat so still I found myself speaking in whispers. The Saguenay River sits in a gash made from ancient ice. The fjords, which loom so tall and mighty over the water, are remnants of a glacier that once chipped away at their granite slopes with the hardened hands of a stonemason. They’re among the largest in the world, stretching from the St. Lawrence River through to the Laurentian Mountains, moving deep into the Canadian Shield. When the glacier receded, it pulled in the seawater from the upper St. Lawrence (which flows into the North Atlantic Ocean) and the freshwater from Lac Saint-Jean. Like oil from vinegar, the freshwater floats on top of the saltwater, and later in a boat en route to Parc national du Fjord-du-Saguenay—Saguenay Fjord National Park—we sat on top of them both. Our boat was actually more like an igloo than a ferry, and made me wonder what this landscape would have looked like as a field of ice. Glass windows domed over our heads, so no matter where you looked you were reminded of how small you are, how dwarfed, next to the Precambrian rock that towers—so incredibly old!—above you. Taking a break from the bikes. As we whipped along, through the glasswork, a patchwork of pine carpeted the walls of the craggy cliffs. When Ave Maria started playing on board, for a brief moment I thought we were sinking. “It’s tradition,” the boat guide said to me. He pointed to a white figure perched high on the green and grey granite summits. The Virgin Mary looked down gently on the bay below with her palms in prayer over her heart. She acts as a reminder that while the landscape is beautiful, it hasn’t always been kind. When Charles Napoleon Robitaille crossed the frozen Saguenay River in 1878, the ice cracked from under him, bringing his horse and sleigh down into the frosty water. As the story goes, with the icy kiss of death on his lips he implored the Virgin Mary to save him, and somehow he survived. But the plunge made him gravely sick, so again, he asked the Virgin Mary to help him recover. And again, somehow he did. Having evaded death twice in concert, he commissioned a sculptor to create a statue of the Virgin’s likeness. At 35 feet high and made of three tons of white pine, she looks over the mouth of the river, her lips pursed against the elements and her body parched from wet weather in a casing of lead. We laughed at the tale, the grandiose homage. I didn’t realize, in short order, I’d be tempted to invoke the Lady myself. 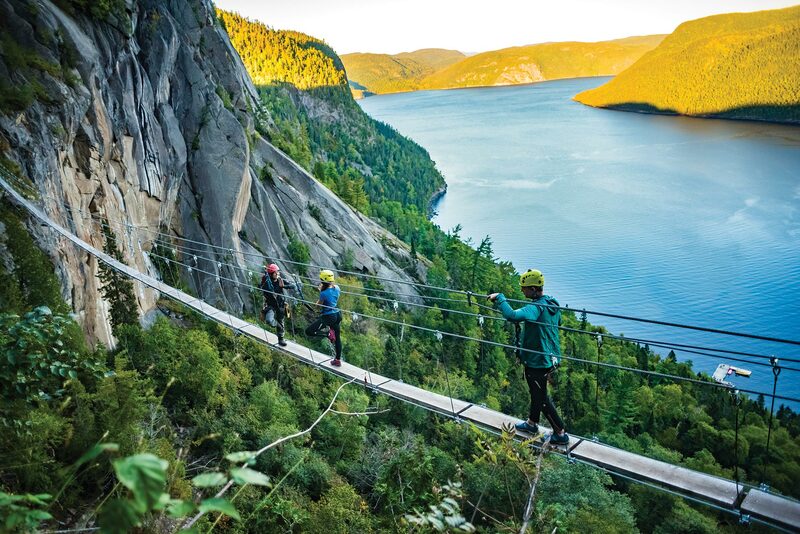 We stood at the Baie-Éternité visitor’s centre deep within Parc national du Fjord-du-Saguenay, a mess of harnesses and helmets at our feet, as I squinted my eyes and tried to follow our guide’s finger up some 300 metres of granite. Our guide was a pocket-sized spitfire named Katherine. She struck me as the type of girl who wore carabiners instead of bracelets and helmets instead of curls. She distributed harnesses and helmets and I looked over at Dan, who shifted from foot to foot with his hands in his pockets, still looking up the cliff. It was the quietest he’d been all week. From the ground, it hardly looked like humans touched the granite walls at all—at a glance, scaling them seemed impossible. Camouflaged against the rock, the iron path we would be using suddenly appeared, and we were led to mountainside rungs known as via ferrata. In Italian, via ferrata means iron road, and it’s typically comprised of a set of iron ladders permanently fixed into the side of cliffs. Dating back to 19th-century Germany, farmers in the Alps would embed iron handles into cliffs to reach higher—perhaps greener—pastures. Now, the activity has transformed from pasture to pastime. Non-climbers can clip carabiners in and out of ladders up the vertical wall to get the incredible view the via ferrata offers without having to have technical climbing skills and with significantly less risk. But we were not soldiers. Rung by rung, ladder by ladder we clipped in and out, traversing higher and higher until the treetops looked like brush below us. Dan moved faster than I thought he would, given his fear of heights. As I passed under a ladder, my back to the wall, I wondered if seven years of bad luck counted on the side of a cliff; but looking out at the fjords I had all the luck I needed, and I hoped Dan had found the courage to look out. The slack line in the sky seemed dormant from a distance, but as I stepped onto the thick cord and made my way to the centre it came alive with a force that bucked and bulled against me. I bent my knees, trying to centre my weight over the coarse cable that snaked under my arches, and while one hand gripped the support wire the other outstretched into the abyss. I might as well have been tight roping across a sound wave! It was then that the thought of falling was no longer a thought at all; it was a momentary dizziness that made my hand go suddenly weak and cast my vision sideways. For a moment, I wondered if like Charles Robitaille before me, I too should ask for help from God; but the Virgin Mary was out of sight and I found myself across. Finally, around the bend and just before a suspension bridge, I could see the yellow sign. Katherine skipped merrily ahead, the carabiners jingling like sleigh bells with every step she took on the narrow, foot-wide bridge. It teeter-tottered from side to side as one by one we walked the plank. From the centre, we paused. There was no ladder left to scale or tightrope to cross. The only thing left to do was admire the view. 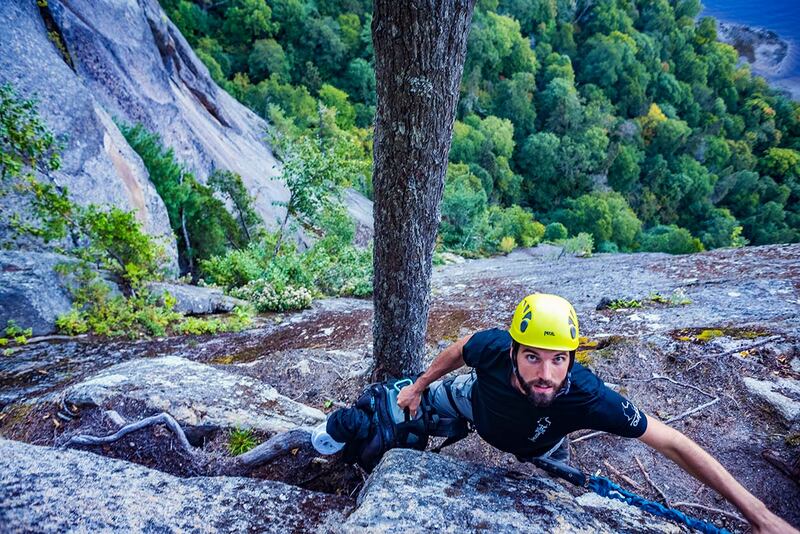 I was sure we had started climbing in Quebec and ended up in Norway. At 300 metres up, we were eye to eye with the fjords. They sat like sleeping giants in the distance, their thick sweater of trees bathed in the sun’s receding light, their balding faces seemed so much fuller from here. “We made it!” I said, as Dan braced himself against the handrail, double checking his clips. “How do you feel?” I expected elation, revelation! Our story ended where we started: all four of us at Will’s farm back in the Eastern Townships, leaning against a tractor, looking at the sky, while a cow mooed in the distance. “Will, you really need to fix that cow,” Dan said, and we assumed our usual positions. Will shook his head and Andrew cocked his, looking questioningly at me as I crumpled into a fit of laughter. A blood moon rose, positioned perfectly for an eclipse as a camera clicked, capturing the lunar light that worked so hard to get to us. We reminisced about our favourite hills, the observatory under the Milky Way, the granite cliffs on the fjords, and how Yolande said Mother Nature would always be there for us when we returned to the earth. As the eclipse’s receding tide of light revealed a shoreline of stars, we fell into the comfortable silence of travellers who’ve wandered together too long. The Moon fell in line with the Earth’s shadow, in that moment joining our souls to the essential things: to the view and to each other. Yo. This story was originally published in Outpost Magazine, March-April 2016. La Belle Province, it read on Quebec license plates until 1978. Although rebranded since then, the unofficial nickname for Quebec continues—it’s hard to argue with anyone who describes Quebec as beautiful! From the St. Lawrence River to the Arctic, old Montreal to even older Quebec City, Canada’s largest province is indeed a land worth exploring. While Quebec has stunning spots across its entire territory, three regions are particularly renowned for their diversity of culture, cuisine and scenery, as well as for the range of activities they offer: The Eastern Townships, Saguenay–Lac-Saint-Jean, and Quebec City and Area. 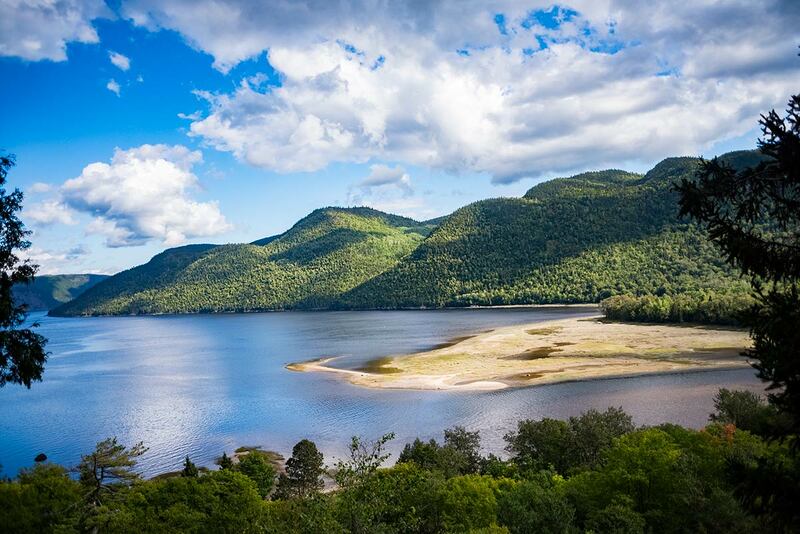 The weather in the Eastern Townships, Saguenay–Lac-Saint-Jean and Quebec City and Area is much like it is throughout eastern Canada, with hot humid summers and cold snowy winters. Yet whether you choose to visit during the winter when waterways are frozen solid and snowdrifts sit like sculptures, or in summer when the skies are incredibly blue and the lakes warm, or in spring when the wildlife awakens or autumn when it comes ablaze with colour, there’s never a bad time to experience this spectacular region. Choosing when to visit is largely dependent on what a visitor wants to see and do—but regardless of when, it will never disappoint. Where: The Eastern Townships are located amid the rolling hills of the Appalachians in south-central Quebec, nestled between the St. Lawrence River and the U.S. border, approximately 150 kilometres east of Montreal. What’s in a Name: Originally named Buckinghamshire, the area became known as the Eastern Townships of Lower Canada in the late 18th century, and simply the Eastern Townships shortly thereafter. Why Go: It has spectacular scenery, with soaring hills and winding valleys, crystal clear lakes, plentiful wildlife and forests that ablaze with autumn colour. Cycling routes and hiking trails. The two highest mountains in southern Quebec. 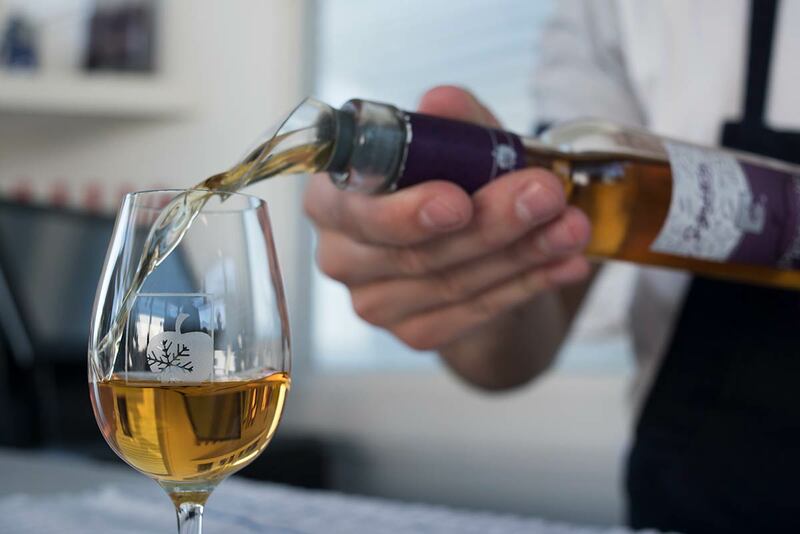 More than 20 vineyards, ice cider, local cuisine, quaint villages and the world’s first International Dark Sky Reserve. Population: The Eastern Townships are home to approximately 330,000 people, the majority of whom are Francophone. Air: Montreal’s Pierre Elliott Trudeau International Airport is the closest airport to the Eastern Townships, though Quebec City’s Jean Lesage International Airport is also an option. A scenic alternative would be to fly into Burlington International Airport in Vermont and drive across the border. Rail: There is no train service directly into the Eastern Townships. However, VIA Rail has regular service to Montreal, from where it is an easy drive. Road: Regular bus service is available to Sherbooke, Granby and Magog as well as a few other points. However, the easiest and most reliable way to get around is by car. 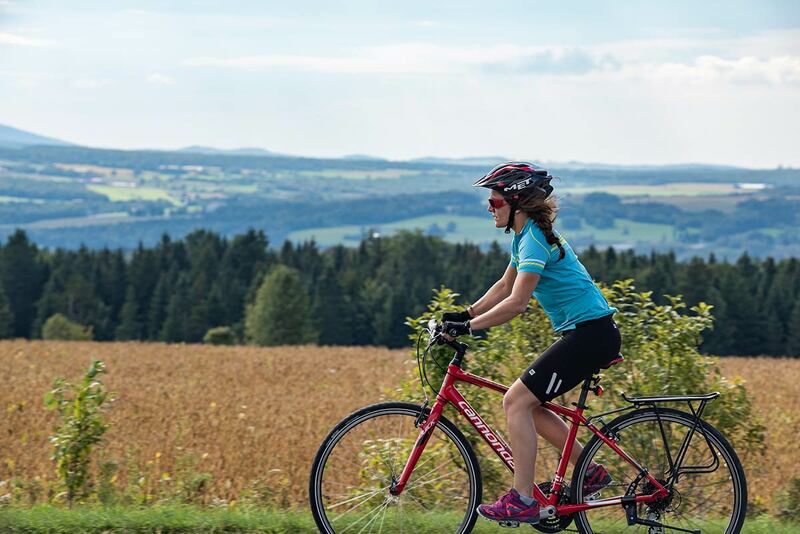 Bike: If you’re exploring the Eastern Townships by bicycle on any of the area’s designated riding routes—and there are many spectacular, well-maintained routes!—Taxi-Vélo-Rando (877.766.8356) offers a fantastic, reliable taxi service for cyclists and their bikes, every day 24/7. The service does not need to be pre-booked (though you can if you prefer), making it ideal for anyone with unexpected mechanical or physical issues, costs about $45 for the first 30 km and $1.70 for every km thereafter, and service is guaranteed within one hour of being called. 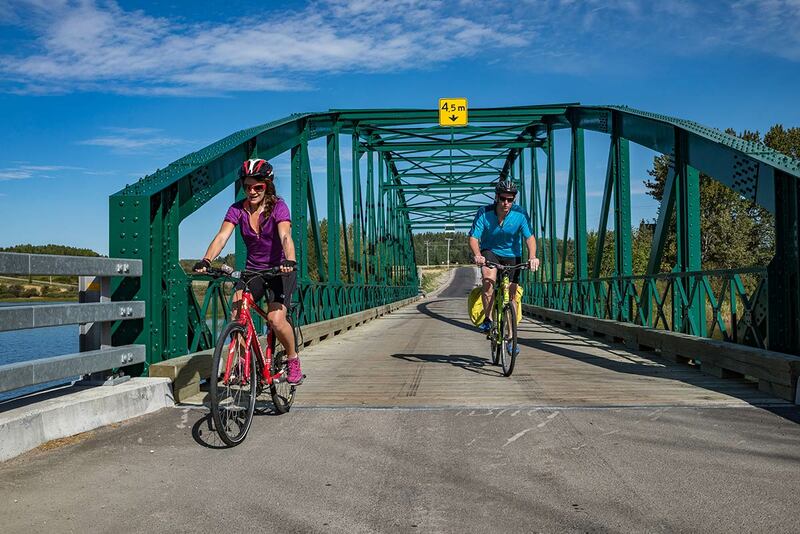 In short, cycling your way in and around the Eastern Townships is a viable and easy option for just about anyone. Accommodation: The Townships offer a wide range of accommodation for every budget and taste, from student residences (during the summer months) at Bishop’s University and Sherbrooke University, to luxury spas and exquisite boutique hotels. There are also bed and breakfasts, youth hostels, campsites, cottages, cabins, yurts and teepees! Where: Saguenay–Lac-Saint-Jean is located north of Quebec City and includes the area of Lac Saint-Jean, the Saguenay River and spectacular Saguenay Fjord National Park. What’s in a Name: Some believe the word Saguenay may have evolved from the Innu word Saki-nip, meaning “where water flows out.” Also known locally as Sagamie, the name is a contraction of the start of Saguenay and the end of Piekouagami (which means “flat lake”), the Innu name for Lac Saint-Jean. 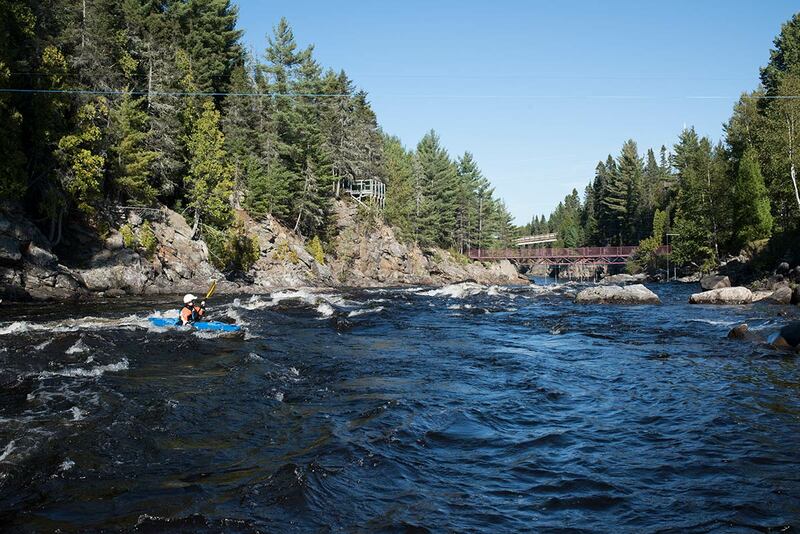 Why Go: It has some of eastern Canada’s finest wilderness and is an area of indescribable beauty. From Saguenay Fjord’s deep waters and soaring cliffs to mouthwatering fromageries. Art galleries and theatres, picture-perfect towns, vineyards, breweries, gourmet poutine, and every outdoor activity you could ever imagination, year-round. Population: Saguenay–Lac-Saint-Jean has a population of almost 275,000, with more than half of those living in the city of Saguenay: a municipality created in 2002 with the amalgamation of Chicoutimi, Jonquière, La Baie, Laterrière and other townships. Air: Air Canada offers two to three flights each day between Montreal and Saguenay’s Bagotville Airport, while Quebec City is the closest major airport, with connections across Canada. 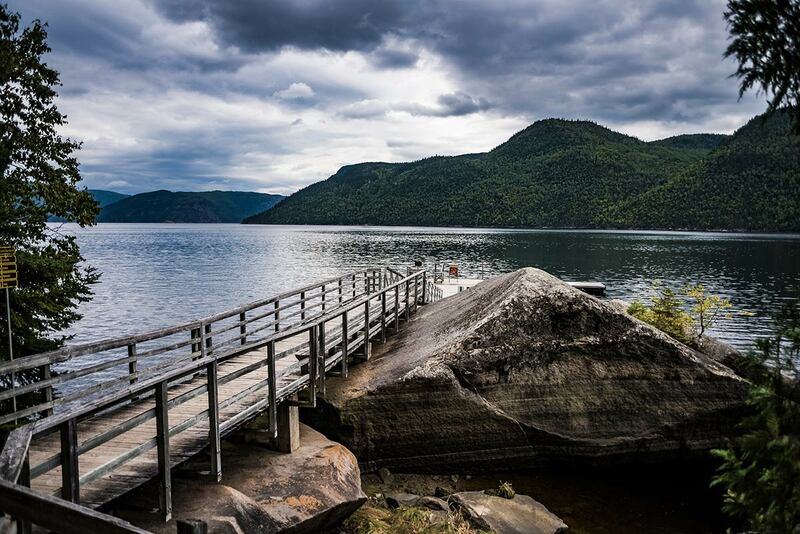 Rail: VIA Rail offers service to Saguenay from Montreal via La Mauricie National Park. Many railway buffs regard it as among Canada’s most breathtaking train journeys. Road: The city of Saguenay is located approximately 200 km north of Quebec City and 460 km from Montreal. Regular bus service is available to both cities. Water: Saguenay can be reached by ferry from Gaspé and the Lower St. Lawrence. Accommodation: Whether you like to camp beside a lake and be awakened by the sound of a distant loon or to recline between Egyptian cotton sheets in a four-star hotel, Saguenay–Lac-Saint-Jean can cater to every traveller. Hostels, campgrounds and some of the country’s finest auberges and bed and breakfasts can be found throughout the area. Where: Quebec City sits on the banks of the St. Lawrence River, 255 km northeast of Montreal. What’s in a Name: Quebec comes from the Algonquian word Kébek, meaning “where the river narrows,” a reference to the constriction of the St. Lawrence River at the city’s east end. “Québec” is the official name in both English and French, although Quebec City and Ville de Québec are commonly used to differentiate the city from the province. Basic History: Originally inhabited by the Iroquoian and Algonquin First Nations, the French explorer Jacques Cartier arrived in 1535 while searching for a new route to the Pacific Ocean. After barely surviving the winter he went back to France, but returned to the area five years later with the intention of establishing a settlement. He built two forts at the mouth of Rivière Cap-Rouge, before once again being driven back to France in 1542. Fellow countryman Jean-François de La Roque de Roberval arrived shortly afterward and expanded on Cartier’s efforts, but he too only lasted one year in the hostile environment. Finally, by 1608, yet another French explorer, Samuel de Champlain, did in fact establish the first permanent European settlement, which by 1665 had a population of more than 550 people. Population: Quebec City has a population of more than 791,930, second only to Montreal within the province. Why Go: Defining itself in part as the only “fortified” city in the Americas north of Mexico, Quebec City is also host to the continent’s finest Winter Carnival every February and home to the World Heritage-classified Old Quebec, where history comes alive with every cobblestoned street, European-style sidewalk cafes and restaurants, the Plains of Abraham, the Citadelle du Québec (Canada’s oldest military building), the Château Frontenac, the Petit-Champlain district, the hilltop boardwalk along the St. Lawrence River with its archaeological ruins, rue Saint-Jean and the Port of Quebec. Classic cycling and skiing, Montmorency Falls, superb hiking and biking trails, and a tasty Croque Monsieur on a sidewalk cafe. Air: Quebec City’s Jean Lesage International Airport is served by all of Canada’s national airlines and eastern Canada’s regional carriers, as well as a number of U.S. airlines and charters. Rail: VIA Rail has regular service to Quebec City from the east and the west, and connections to U.S. railways. Road: There is regular bus service from Montreal and Atlantic Canada as well as throughout the province of Quebec. Water: The Port of Quebec is one of Canada’s largest and receives more than 100,000 passengers each year. Accommodation: The sight of the castle-like Château Frontenac in Old Quebec rising high over the city is one of Canada’s most iconic images—a stay in the legendary hotel is worth blowing the budget, if even for a night. However, if you can’t quite stretch it to that, there are scores of affordable hotels, auberges, bed and breakfasts and hostels throughout the city.